A bigger Hammer is happening in Westwood. The museum just announced that the museum a 99-year lease and will be expanding into 40,000 square feet of gallery and support space. In addition to remaining in their existing building, they are taking over square footage in the first five floors of the adjoining mid-century office tower by Claud Beelman, who in addition to designing the 1962 Occidental Petroleum building created the Superior Oil Company headquarters (aka the downtown Standard Hotel) and the Art Deco Eastern Columbia Building in DTLA. The property recently purchased by UCLA, which will occupy floors six through sixteen of the tower. 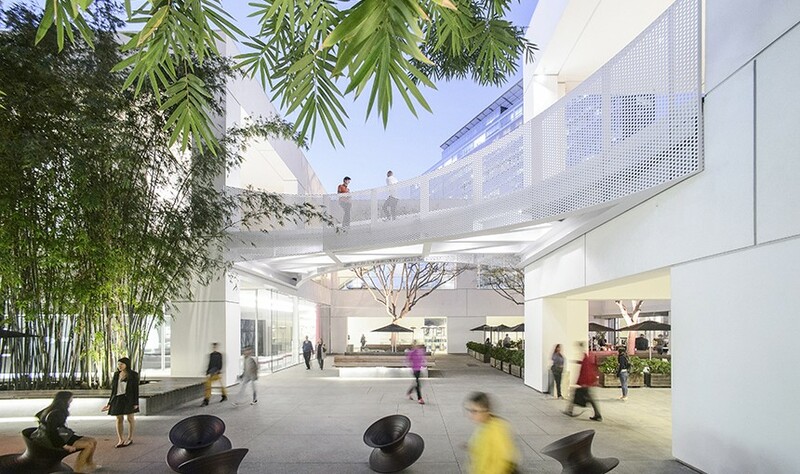 New York architect Edward Larrabee Barnes designed the original Carrara marble-clad Hammer Museum building in the early 90s, but in the years since it’s been renovated several times by L.A.’s own Michael Maltzan. He designed the Billy Wilder Theater, the Museum Café, and most recently the John V. Tunney Bridge. The Hammer did not say if Maltzan would be participating in the expansion. According to the Hammer press release, the additional space will not only allow for larger galleries, but for ones dedicated to the Hammer Contemporary Collection and works on paper. A new study center for the UCLA Grunwald Center Collection, a classroom, and support spaces will round out the new scheme. To pay for the expansion and upgrade, the museum received a $25 million cash payment to be invested in what the Hammer calls its “quasi-endowment.” A capital campaign will follow. No date was given for the opening of the improvements.